PLEASE REQUEST A MORE ACCURATE QUOTE FOR Up to 17 Guests in a large 2 story house with 2 separate apartments. The property address is, 8 Cowry Close Tangalooma. Situated on the top of the beautiful Bay view Estate directly behind Tangalooma Resort the house has all the modern conveniences including, dishwasher, icemaker fridge, pool table, spa bath, large kitchens, barbecue, parents retreat and long wide balconies to maximize the breathtaking views of Moreton Bay, the Glass House Mountains, and the surrounding Coastline. Dolphin view has the only pool on the hilltop estate. 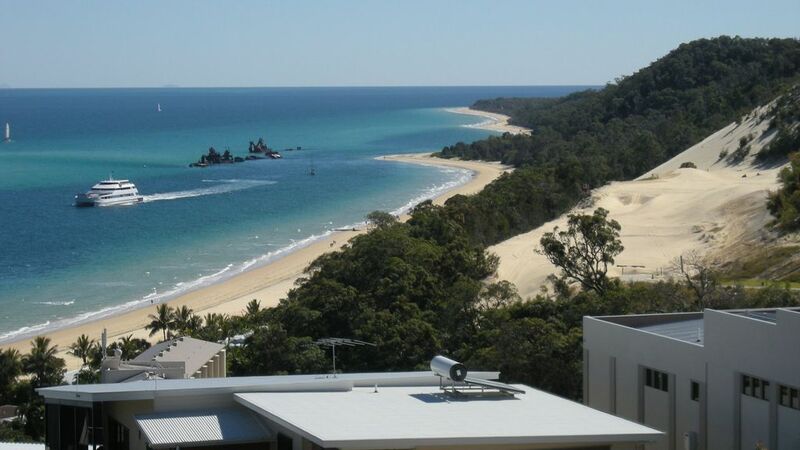 As a guest of Dolphin View, you are able to use all of the facilities and activities at the Tangalooma Resort. Each apartment is fitted with a spa overlooking the ocean, 50" LCD TV, DVD player and extensive movie library, stereo system, washing machine, dishwasher, fridge and gourmet kitchen, Webber BQQ. Swim in your own pool overlooking the ocean. This Upper-level apartment has a pool table and extra 58" LED TV in the movie room. We provide all bed linen and towels and bath mats and hand towels at an extra cost of $25 p/person per stay or bring your own. FREE 4 GB WIFI data with every booking (No Youtube or data streaming). $10 per extra Gb usage. I grew up in Germany and came to Australia in 1071 In the mid 80s I had my first boat and took my children to the unspoiled beaches and crystal clear waters of Moreton island. I fell in love with the Island and after many years camping there I was fortunate enough to purchase this land and build the house in 2006. It took over 1 year to build as everything had to come from the main land. Best views on the island. Free Wifi, gourmet kitchen with Ice-maker fridge. Private swimming pool overlooking the beaches. Media room with pool table. On the hill 600 mt away from the beach. At the resort, free tennis racquet. Also a squash court with free gear. our second stay in apartment; we are already planning our next visit a year away!! our kids and grandkids enjoyed all aspects of stay. The location was excellent and besides the two A/C units not working everything went well up until return of the bond. The owner fabricated claims that there was a cigarette stain, a pillow stain and a broken bowl all of which were categorically false however the owner still TOOK HALF THE BOND. No smokers on the trip at all and we left the house in a better state than we arrived. PLEASE ensure you take before and after photos of the property and also factor in to your budget not having the bond returned. We had an absolutely fantastic stay at Dolphin View Apartments. The house is amazing (my favourite is the top level) and great for several families to stay together. All of the beds are really comfortable - not just your standard mattresses. Very well furnished and the kitchen cupboards and draws are stocked with everything you need for cooking and serving your meals. The house was also very clean. The kids loved the pool and it's the only house on the hill with one. The view is just amazing and the breeze in the afternoon makes being on the hill the best location. Wolfgang the owner is great to deal with and we made a few changes and he was very helpful. He also provided a detailed list of instructions/information when finalising the booking - which also included notes on not using the internet for streaming - which is a given when there are so many people in the same house - especially kids with all their internet usage. So not sure what the bad review is all about below! We will definitely be booking this house again in the future as we all loved it. A group of us, some with children, rented both floors for a few days. We found having the two floors was great because the families could stay on the ground floor in close proximity to the pool, which the kids loved. The rest of us got peace from the kids in the morning and the kids got peace from us in the evening! The games room, in particular the play station, also kept them amused. Us adults for the most part kicked back on the upper balcony enjoying the view. The resort is an easy walk down the hill and good exercise coming back up (we chose not to rent the golf buggy). If I had to pick on something, the barbeques (one on each floor) are a bit small (the portable oval kind). Apart from that, the kitchen is great and well supplied, the house has more space than we knew what to do with and it's kept really clean. The owner was generally responsive to my queries and the bond was returned with no issues. Highly recommend this house. We will return. My friends and i stayed in the top floor of this very spacious modern home for a few days over the christmas break. The rooms are beautifully furnished and large, with breathtaking views from the balcony and master bedroom windows. Having the house on top of the hill was a nice touch as we were able to get up and out of the resort when we were after some privacy and quiet time to relax and enjoy our beautiful surroundings. Beware, as we lost some of our security deposit for unclear internet usage and dealing with the owner was quite stressful! This is a lovely place BUT we had undisclosed costs hit us. Don’t try and cancel the linen less than 3 weeks from arrival plus the linen provided had sheets for 2 beds that did not fit! Watch out as the internet is very expensive although you are not told that before you go or when you hit the limit! We ended up with a surprise internet usage cost of $145. Guest passes to the resort were not provided, our free champagne on arrival wasn’t there, the garbage bin was overloaded the day we arrived so we had to deal with rubbish and smell for part of the week. Lots of lovely places on the island so look around. Moreton bay is a national park with little or no infrastructure. To explore the island you need a 4x4 as there are no sealed road and most of the commuting is done on the beach. If you come without a car you need to book the transfer with the Tangalooma flyer. Your luggage can be delivered from the Tangalooma pier to the house if you book a taxi van with the resort. Travel time 4 min and cost of $15.00 AS OUR GUEST YOU ARE PART OF THE RESORT AND CAN USE ALL THE RESORT FACILITIES. There is a shop at the resort that stocks most food and drinks but you pay double. Best to bring all food and drinks you need. To be more informed look at the Tangalooma website and moreton island. You can use the many of the resorts tours or activities such as snorkel tour around the wrecks, tobogganing the sand hills, quad bike tours, jetskie tours, scuba diving etc. In our house we offer 3GB free wifi ($10 per extra GB).